Well, it wasn't all that bad (see here and here for what I mean by bad), so I thought I'd share some of the lovely things we discovered together on our family trip to Sicily. Our first night, we just relaxed at this Airbnb outside of Palermo, which I highly recommend. Arianna, the hostess, and her family are just wonderful. The property includes the guest house (where we stayed) plus two other houses (one house for her parents and one house for her own family), a donkey corral, citrus groves, and a chicken coop. 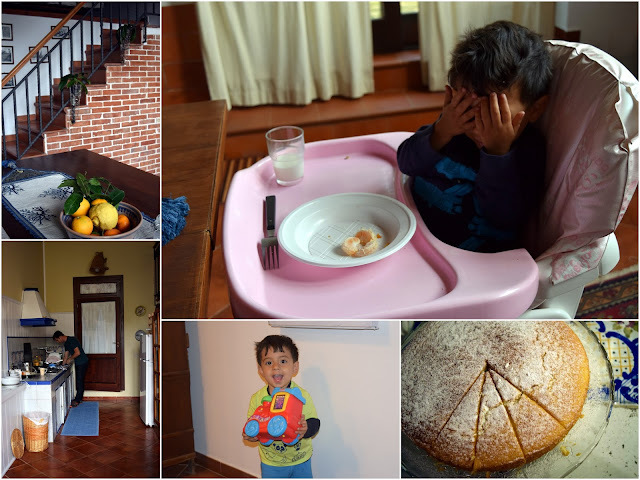 Arianna left us a big bowl of citrus fruits as well as fresh milk and a homemade cake. We were so exhausted from traveling that she even offered to make us a simple pasta dish for dinner, which we gladly accepted. With three little ones of her own, there were plenty of toys in the apartment and around the property to keep Hunter busy. The next morning, we were off quite early to begin exploring. We drove south to the archeological site at Selinunte. Although this site is a little more rugged and less frequented (so less manicured) than the Valle dei Templi in Agrigento, we had a great time. Of all the temples, only one has been re-erected (Temple of Hera) and it was under renovation, but there was still plenty to see including the urban plan at the acropolis. It was fun to walk up and down the streets and imagine what life was like back in the 4th century BCE. That evening we arrived for a late dinner at Ciuci's Manor (our accommodations for 2 nights), where we enjoyed a feast that included olives and pistachios grown on the property as well as a traditional Sicilian cake known as Cassata. Ginevra (our hostess) explained that the whole history of Sicily can be found in this cake. Her explanation had to be my favorite part of the evening, and by the way, it was delicious! Marzipan, sponge cake, chocolate, ricotta... YUM! Tip #1: Visit Sicily during Easter! Both Arianna and Ginevra said we were visiting at the best time of year because of all the special events going on in the villages as well as the special foods available only during that time of year. We woke up to a delicious breakfast spread and then headed down with a bowl of day-old bread to feed the ducks. Hunter got to see ostriches, geese, goats, and donkeys. Ciuci's Manor, located outside of Agrigento, is a really great place for children, and I also highly recommend staying at this property. 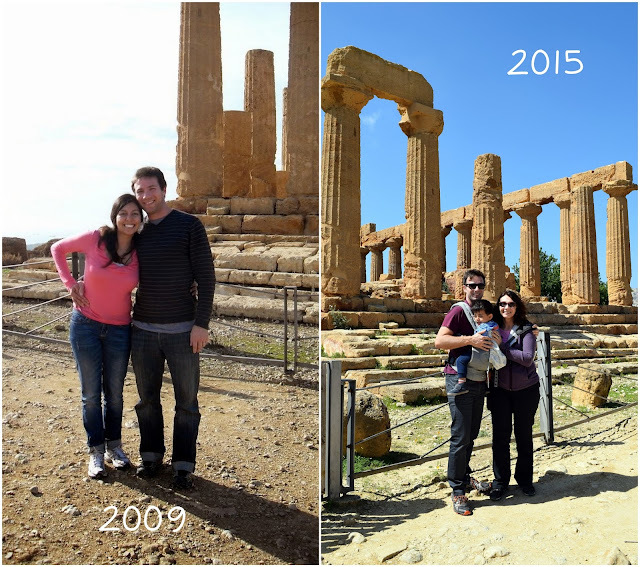 After a liesurely morning, we headed down to the Valle dei Templi to see the temples in Agrigento, which I also wrote about here when we lived in Switzerland. Tip #2: There are two places to park and buy tickets -- at the bottom on the hill across the street from the Temple of the Dioscuri or at the top of the hill near the Temple of Juno. For time saving, or if you are with a travel companion who may not have enough energy to hike up to the archaeological site and back down to the parking lot or vice versa, do this: park at the bottom, take a taxi "shuttle" up to the other lot, start your visit there, and end up back at the parking lot. One more thing, there is a bar/cafe on site, but it's nothing spectacular. Plan accordingly. Wow, Amanda, it sounds amazing! And you took some really great photos! Now I want to visit as well and go to the exact same places, you made it all sound so good! And OMG, are they eating arancini? Soooo good! Thanks, Elisa! Sicily is such an amazing place, though I am not sure we'll ever make it back there. We still haven't seen Palermo or Taormina -- and this was our second visit to the island. Honestly, if we ever get to go back to Italy, I want to see Sardinia, and I will def be asking you for tips! 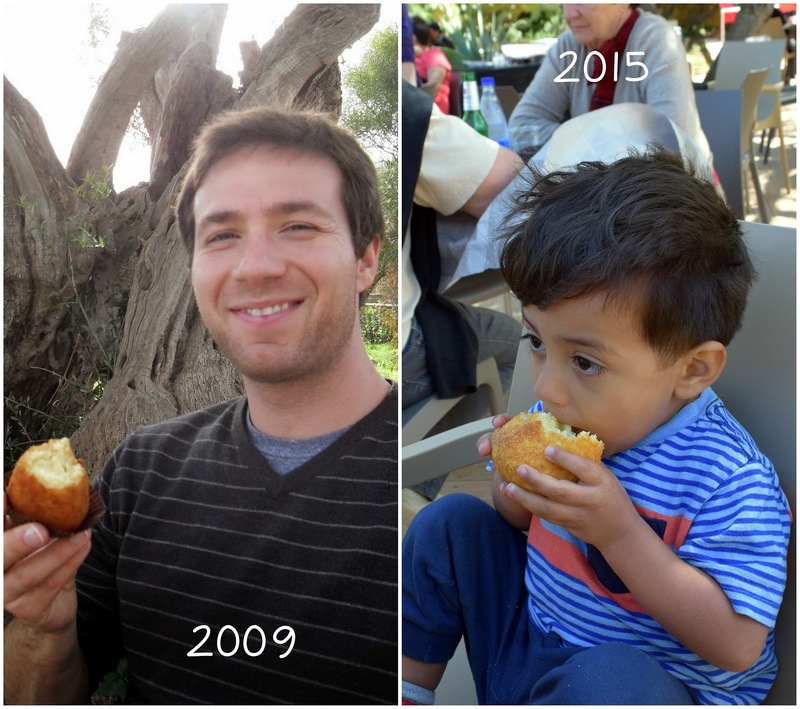 Yes, they are eating arancini! It was just about the only think Hunter would eat! !